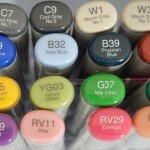 Copic markers will be a sort of de ja vu for many. Do you remember when you were a child, you used to color? Yes, I understand that many of you grew up in the electronic age. My granddaughter, at the age of 2, had her own I Pad. I know her dad is a computer guy but REALLY? However, she’s 4 now and still plays with coloring books and crayons and knows how to use them…..well, sort of. I’m a stay in the lines kinda gal and her…well, not so much. LOL. – If you’re going to stamp an image then color with Copic, test the print first. Some of the inks will bleed. The safe inks are Memento ink pad and Ranger ink pads. Copic markers have a number system. See the numbers on the end of the Sketch markers. – The second digit indicates the shade 0 being the lightest and 9 being the darkest. I admit that I tried other markers because my first thought was these are too expensive but, in the long run, I like these the best. When you factor in that they can be refilled, over time, they do end up being less expensive than the others. While you can get them in Michaels or Hobby Lobby, as usual, Amazon seems to have some good deals. That’s where mine came from. As you can see, this isn’t your coloring book colors but most of us that are scrapbookers also make cards (perfect way to use scraps right?). These are great for those projects. You can alter background papers for your pages or color in rubber stamps for personalization like hair and eyes. While he doesn’t use Copic markers, his art is still none the less beautiful. I LOVE my Copics but you can use whatever you like just as long as you can escape and be a child for a while, relieve your stress and be creative. It’s a mini vacation or meditation in itself. Life can be overwhelming at times and our brains are going at warp speed. Quiet the chatter for a moment. Use your imagination, color and create! Of course, I just covered the tip of the iceburg. Yet, I hope I’ve peaked your interest. I’ve had the airbrush system on my wish list for a while now too. So cool. Thanks for stopping by, Kimberly.